Old Spanish documents refer to this river sometimes as the Rio Agna and other times as the Rio de Lagna. On a map dated 1683, it is referred to as the Rio Lana. English maps of the eighteenth century show the name as Ogeelaganu and Ochloconee. In this name the river probably retains at least the flavor of its Hitchiti language name. Variations of this continued into the 1800's with names like Ockatockany (1855) and O-clock-ney (1822). Both the names Lagna and Lana may be Spanish renditions of the Muskogean word LAH'nee for yellow. In those days Georgia clay would have made the entire river as yellow as the river above the 60 year old Lake Talquin dam is today. In about 1716 the Rio de Lagna gave some difficulty to a party of Spaniards inspecting the Spanish ruins in the area (Spain deserted this area for awhile after the wars of 1702-4). Recent flooding of the Ochlockonee River can give us an idea of what they were up against as heavy rains and flooding had impeded their crossing. What is really interesting about this group is that they reported seeing about 300 buffalo and a few Spanish cows on their way from the Lake Jackson (Okaheepee - "Disappearing Lake") area to the Rio de Lagna. There were so few people remaining in the area the buffalo were moving in to graze on the old fields! Documents dated August 1704 show that a felucca dispatched from Pensacola with emergency munitions landed at the Rio Lagna. After landing they received bad news of the downfall of San Luis, a mission that was located in the western area of what is now Tallahassee, Florida. The Ochlockonee begins its 160 mile trek to the bar off Mashes Island somewhere up in Worth County, Ga. The rich yellows and reds of the clay soil gives the river a yellow color. The bar and the shallows of the Ochlockonee Bay owe their existence to the volume of sand and clay brought down by the fast flowing river. 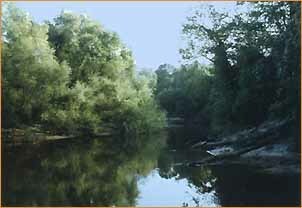 As the river flows into the bay it slows and can no longer carry its load of silt. The silt drops out and settles in the Bay on the incoming tide and farther out on the bars at other times. In the early days floods would flush those silts out into the Gulf. The Talquin Dam has stopped much of that not only by taming all but the really big flooding situations but also by providing a lake which slows the moving water. The River now drops much of its sand and silt in the lake instead of in the Bay. This 1987 photo shows the size of the Ochlockonee River near the Florida/Georgia state line. The Ochlockonee is the boundary between Leon and Gadsden counties in northern Florida. 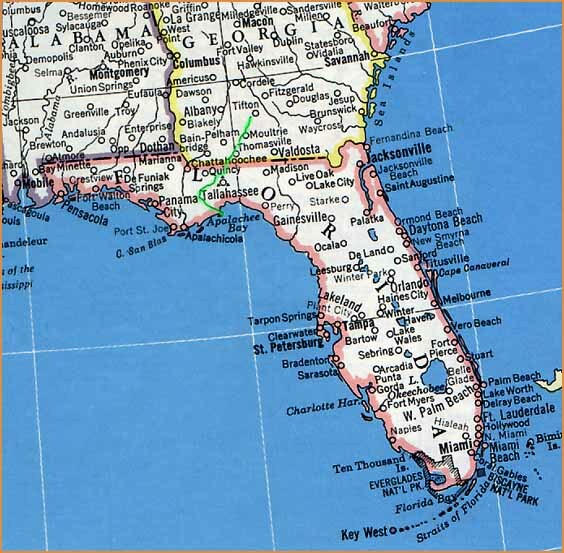 As with the other rivers of Wakulla County, The Ochlockonee provided the influx of settlers of the 1820's and 1840's with instant access to the land. Although there were both Spanish and Indian roads long before this time one must note that neither were roads for wagons as the Spaniards made no real use of wagons here. Both Indian and Spaniard went by foot or horseback. (Horses did not exist in the area before the arrival of the Europeans with their horse-mounted soldiers.) The Ochlockonee was to narrow to provide access for open water vessels, as the St. Marks River could, but it certainly did provide a waterway access between settlements. Fort Stansbury was established on the Ochlockonee River in about 1840 by placing palisades around a large (two story?) house that had been deserted by it's homesteader family because of the Indian raids of the period. This fort figured heavily in the forced removal of many Indians (some of them were raiders, most were just Indians trying to eke out a living). Boats went up river to load and move them down to other ports for removal to "Indian Territories." Now that its okay to be of Indian descent, we find that not all Indians were removed as some stayed to meld in with the local populations. Fort Stansbury was abandoned by 1844. The Ochlockonee River saw at least one action during the Civil War. Two USS steamers with 130 men in eight small armed vessels (also an ambulance boat) went ashore at Mashes Island to destroy the salt works and fifty salt boilers. They also captured the three remaining Confederate soldiers and six "contrabands" (Negros).